Industrial Rubber’s Rotary Jet Mixing System is designed to proportion and blend dry cementing compound with the carrier fluid to provide a continuous supply of cementing slurry with predictable properties. 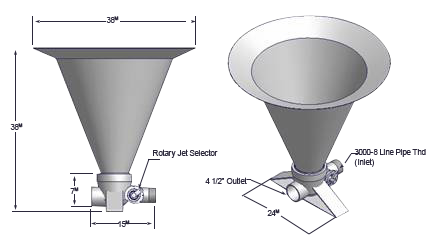 The system functions by forcing a stream of water through a jet and across a mixing bowl into the discharge line. The stream of water forced through the mixing bowl creates a vacuum, pulling the dry cementing compound down from the hopper above. The rate of slurry production and composition of the slurry are determined by the size of the jets used. Industrial Rubber maintains in stock hoppers, mixing bowls, and jets. Other components of the mixing system are custom made to your specifications. A larger 4” ID outlet is also available upon request.